No matter what the meaning is for you, we hope giving the gift of the Vollmer Farm to someone you care about will be both a personal gift and a rewarding one for both you, as the gift giver... and the lucky recipient! With a Vollmer Farm Membership Plan you will be stretching your gift giving dollars and offering the recipient a larger "value" than what you actually pay. It may sound complicated, but actually it is quite easy. Just click the button below to learn more about our Membership plan options! Here's what a Vollmer Farm membership card looks like! It can be used at our main farm and any of our Spring Farmers' Market locations! Simply click the button to the left to learn more and complete the enrollment form. We will mail out the membership card right away to you or directly to your lucky gift recipient! 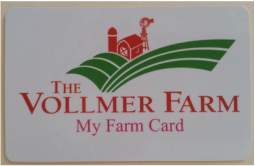 Vollmer Farm Gift Cards are like other traditional gift cards and can given in any dollar increment of $10 or more. Our customers buy these for all kinds of reasons from kids' birthday gifts, teachers' gifts, birthday and holiday gifts, and "just because"! It is a fun, unique gift that will "keep on giving" the recipient much joy as they use the card in any way they want at Vollmer Farm in Bunn for farm fresh produce, Market gifts & items, Ice Cream, etc. In the fall, the cards can be used at the farm for all kinds of great stuff like pumpkins, Back 40 admission passes, etc. The gift cards will also be valid at any of our area Farmers' Market locations in the spring of the year. Please note that at this time, we are not able to use gift cards toward food purchases in the Back 40. Click here to order your Vollmer Farm Gift Card today!